The Invoices section of the Merchant Console displays all invoices (an itemized statement of goods and services) you have created. On this page you can create a new invoice, search through all invoices, and set up your invoice options, and create a new invoice. To access the Invoices section, click on 'Invoices' in the side menu bar. 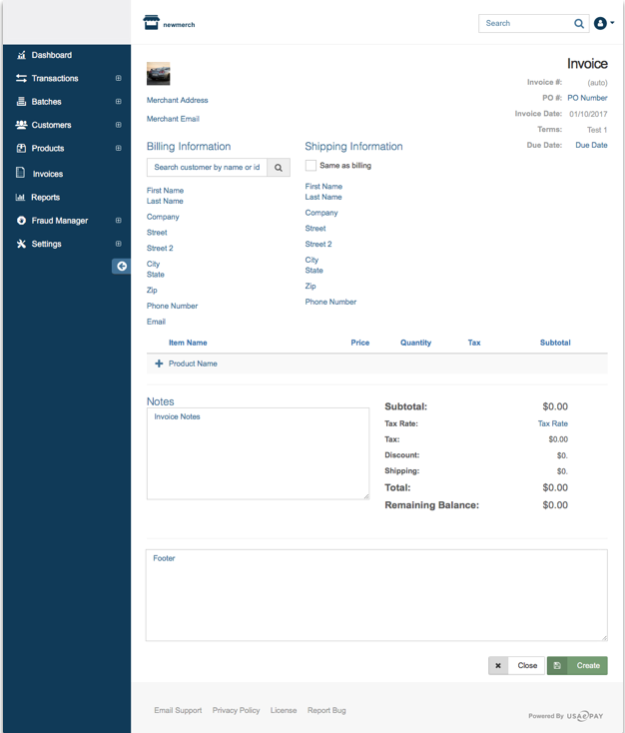 The first screen displays all invoices made on the console along with the following information for each invoice: Invoice #, Due Date, Customer Name, Company, Customer Email, Amount, Amount Due, Status, and Date Created. You will see explanations of each of these fields below. Please Note: These fields are fixed and cannot be changed. Invoice #: This is the number assigned to a specific invoice. Due Date: This shows the date payment is due for the invoice. Customer Name: This shows the name of the customer being billed for the specific invoice. Company: Shows the customer’s company name. Customer Email: Displays the personal email of the customer. Amount: This shows the amount that will be billed to the customer. Amount Due: This shows the total amount that is due for payment. Quote: The invoice is still in draft mode, and has not been sent to the customer yet. Sent: The invoice has been sent to the customer, but the customer has not viewed it yet. Viewed: The invoice has been viewed by the customer. Paid: The customer has paid the invoice. Refunded: The original amount the customer paid on the invoice has been refunded to them. Overpaid: Customer has paid more than was due. See the Void Invoice section of this page for further details. Created: This column displays the date the invoice was first created. Tap on the category to arrange the invoices according in either ascending or descending order according to that specific category. 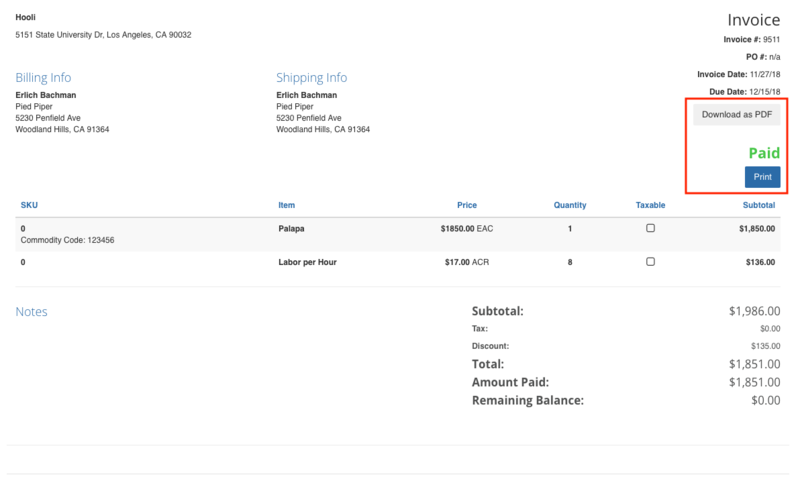 You can create an invoice to bill a customer by clicking on the +Add Invoice button. Clicking this button will take you to the following page to fill in all necessary fields. If you have already filled out the Merchant Profile section of Settings, then the merchant information will automatically populate. If you have not completed your merchant profile, then you will need to enter it in manually. The Merchant Address and Merchant Email are required and must be entered to create an invoice. Under the Billing Information section, you can add the customer’s information by manually entering the information into the different fields or by using the search field to find a customer who's information has already been entered into the customer database. Search for the customer by typing the customer’s name or ID number into the 'Search customer by name or id' field. All matching results will appear in the drop down menu. Select the customer you are looking for. All saved billing information will automatically appear in the appropriate fields. 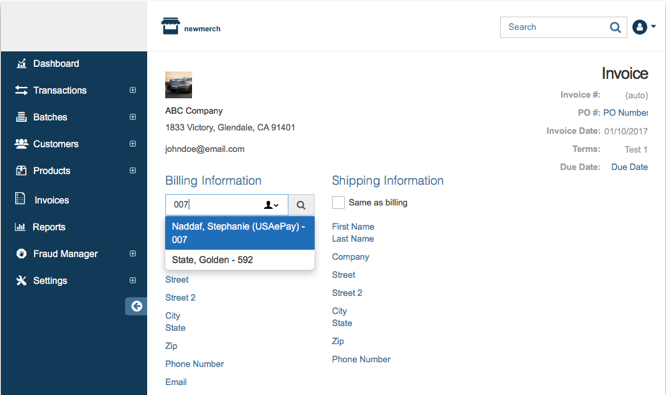 To auto-populate the Shipping Information with the same information in the Billing Information section, check the box labeled 'Same as billing'. If the Shipping Information is different, enter it manually. Under the Invoice section, the Invoice # and Invoice Date are required to create the invoice. 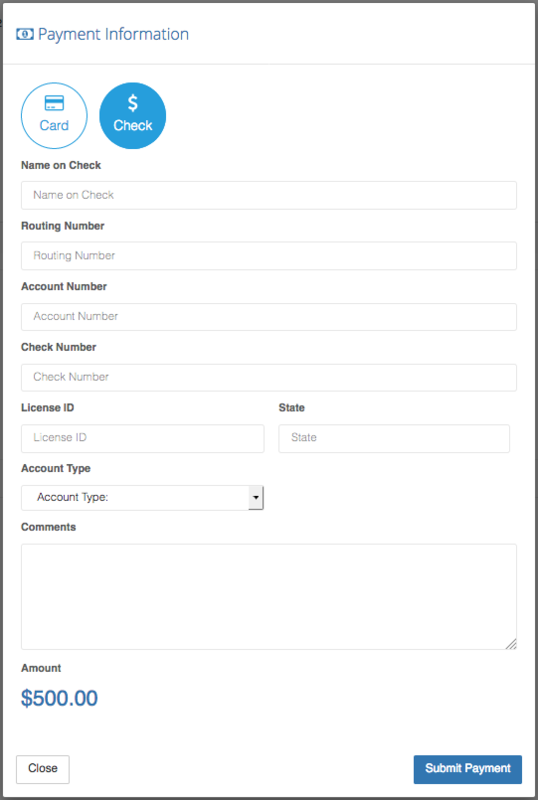 Invoice #: This will auto-populate if the Generate Invoice Number setting is enabled in Invoice Options. If the setting is not enabled, manually enter an Invoice #. PO #: This number refers to the customer’s purchase order number. It is usually only required when processing corporate cards. Invoice Date: This refers to the date the invoice was created. Terms: This will auto-populate if you have entered the terms into the Default Terms field in Invoice Options (also see Invoice Options to see descriptions of the term options). If nothing has been entered, you can select one of the term options from the dropdown menu or enter custom terms in manually. Due Date: Enter the date that the consumer must pay by. You must add at least one product before an invoice can be created. The Product Name, Price, and Quantity are the required fields to add a product to the invoice. 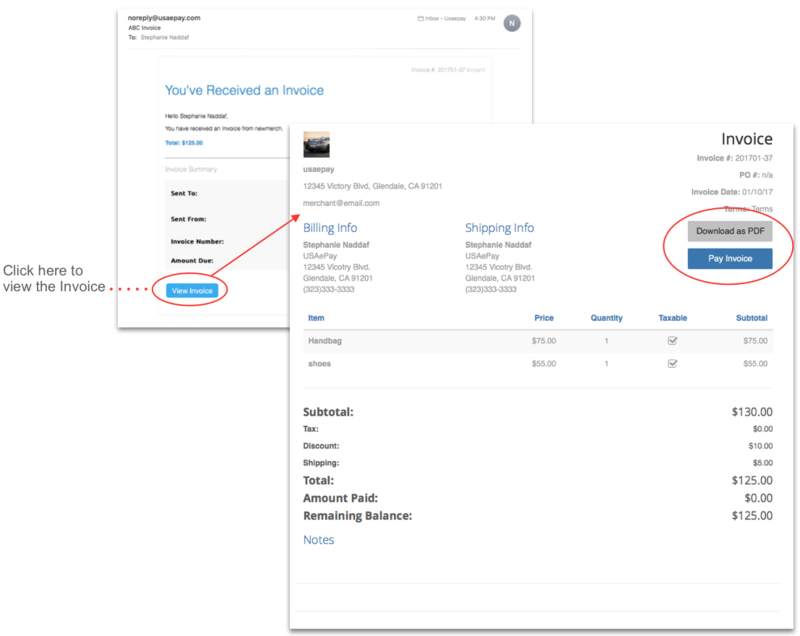 There are two ways to add a product to the invoice: add an existing product from the Product Database or create a custom product. To begin adding a product click Product Name and begin typing the name of the product. Products that include the criteria you enter will appear in a drop down menu along with the option to '+Add Custom Item'. 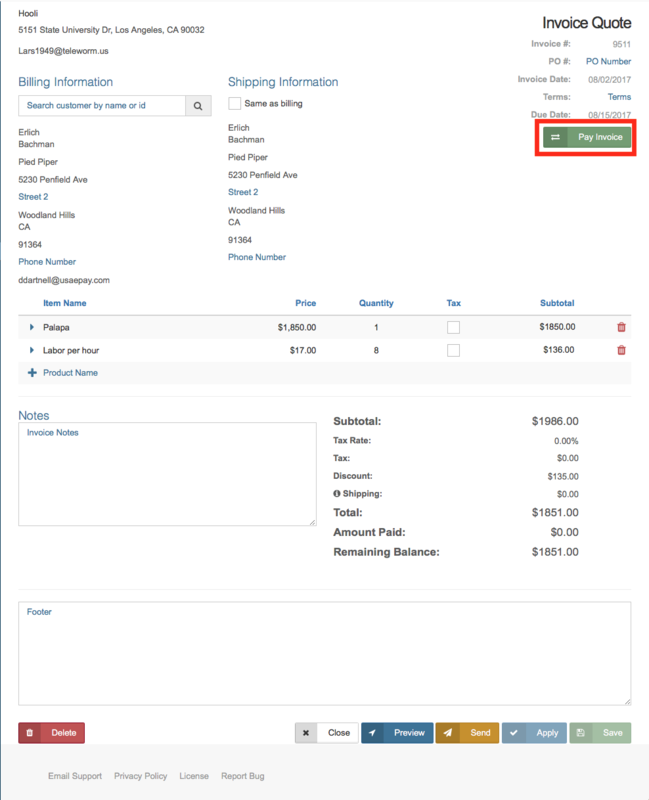 To add an existing product, click the existing product in the drop down menu and it will be added to the invoice. Only the Quantity can be adjusted. All other fields are auto populated from the Products database. To add a custom item not in the Products database, type the full product name and then click '+Add Custom Item' in the drop down menu and it will be added to the invoice. After the custom item has been added, enter the price into the price field and leave the box in the Tax column checked if the item should be taxable. If the item should not be taxable, leave it unchecked. To adjust the Quantity for both existing products and custom items, select the current quantity, delete it, and type in the new quantity. The subtotal for the item will automatically update, as shown below. For all products, you can click the icon to the left of the item name to expand product info and show additional fields. Additional fields include: SKU, Commodity Code, Tax Rate, Unit of Measure, and Description. 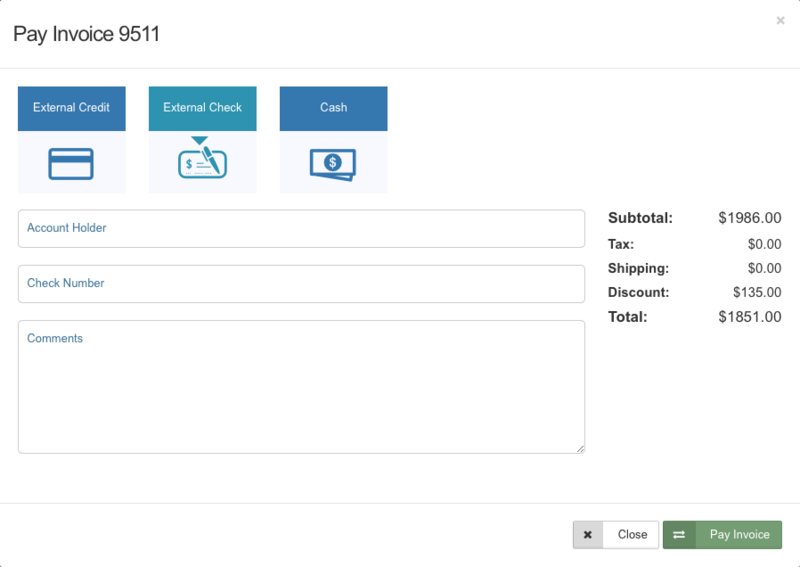 Commodity Code and Unit of Measure fields will display in the line items on all of the invoice pages, if the merchant is enabled for Level 3 processing. For custom items, you can edit these additional fields. 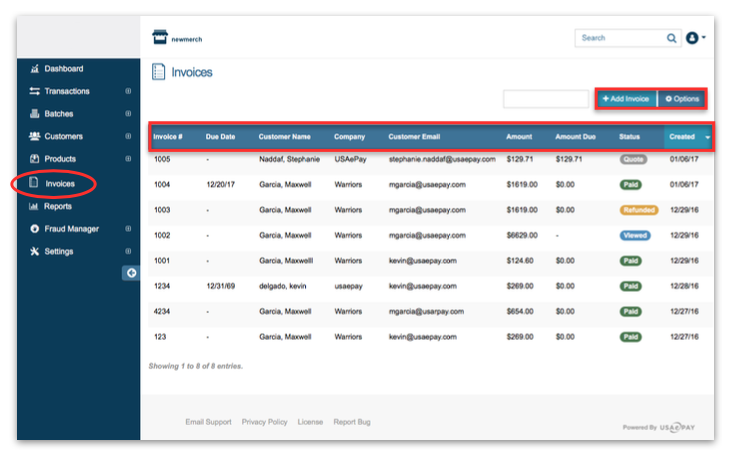 For existing products, these fields are auto-populated from the Products database and cannot be changed from the Invoices page. To change this information for existing products, click the package icon (seen below) to the right of the item name. You will be taken to the product profile in the Products page where you can edit the product information (including price and taxable status). This icon will only show for existing products. 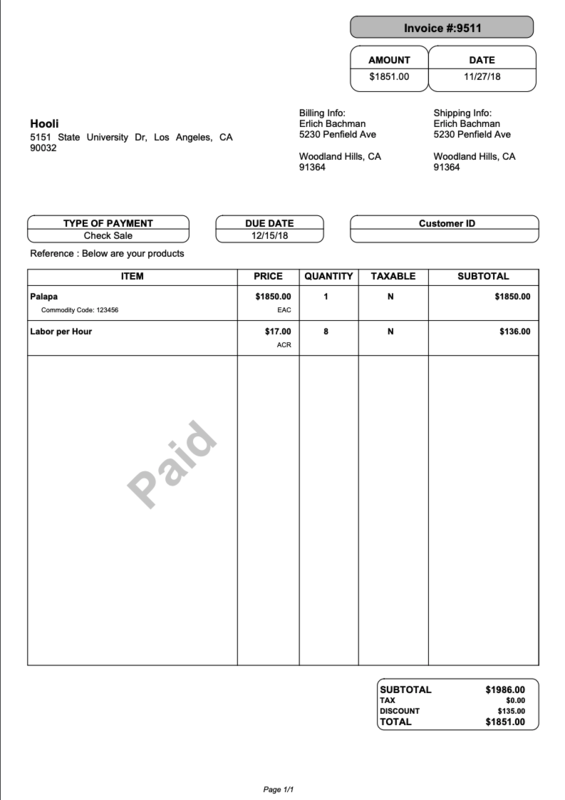 To remove the product from the invoice, click the trash icon shown below. The Notes section allows you to leave customized messages for your customers. Notes will appear both on in the invoice email and on the invoice itself. Customers will see the notes you type in this field. Notes are optional. Subtotal: The total amount due BEFORE the Tax, Discounts, and Shipping costs have been applied. Tax Rate: Tax Rate by percent. 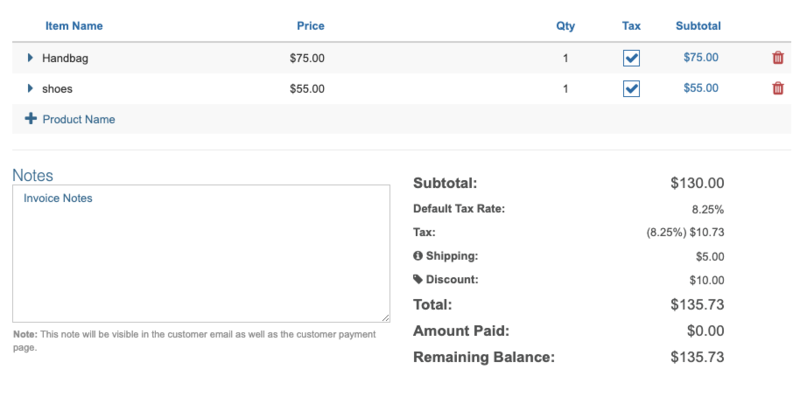 This will auto-populate if the Tax Rate setting is set in the Invoice Options. If there is no rate populated or if you need to adjust the rate for this invoice, simply click the current rate, delete it, and then enter the new rate. This field is optional. Tax: The amount in dollars the customer will be charged in tax. This amount cannot be adjusted. The system calculates it using the ‘Subtotal’ of taxable items and the Tax Rate (above). Nontaxable items will not contribute to this total. Discount: To apply a discount, click the discount amount and enter in the amount you would like to discount the total (in dollars). Discount is applied after the Tax is calculated. This field is optional. Shipping: Shipping costs. 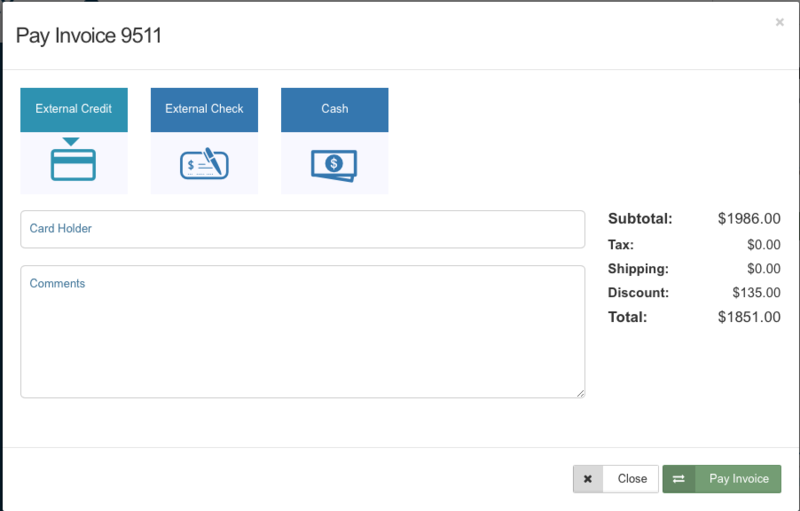 To apply a shipping costs, click the shipping amount and enter in the amount the customer will pay for shipping. Shipping costs are applied after tax is calculated. Total: The total amount to charge the customer (SUBTOTAL+TAX-DISCOUNT+SHIPPING=TOTAL). Remaining Balance: The total amount the customer had not yet paid. For newly created invoices this will equal the Total field. 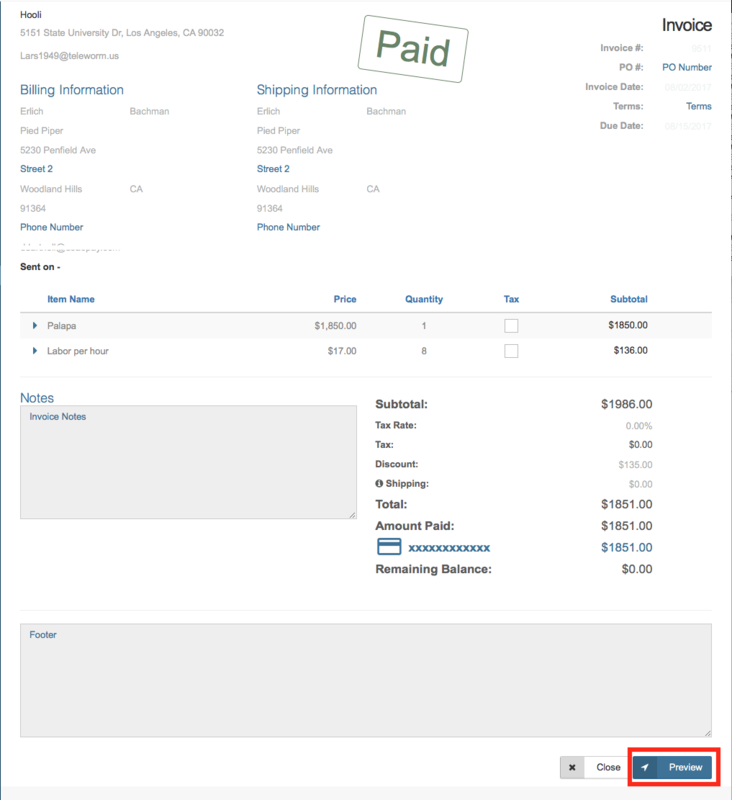 Once all fields have been entered, click on the 'Create' button at the bottom of the page to create the invoice. Preview- Click here to preview how the invoice will look to the customer. Send- Click here to send the invoice to the email listed in the customer's billing information. Apply- Click here to apply all the changes and keep working on the invoice. 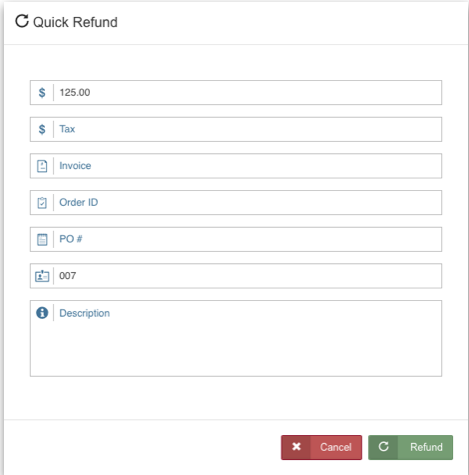 Save- Click here to save any changes made to the invoice and return to the Invoices main page. Delete- Click here to delete the invoice. Close- Click here to discard any changes and return to the Invoices main page. Clicking on the 'Preview' button will allow you to see the invoice as the it appears to the customer before you send it to them.. 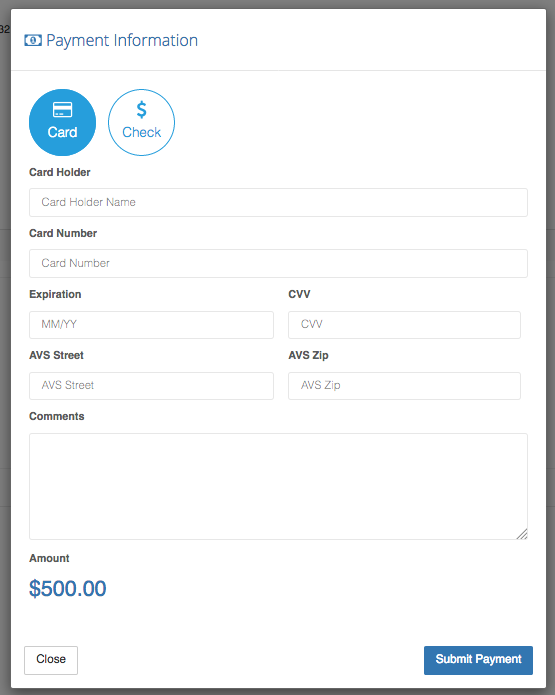 The Merchant Console allows you to send the invoice in one of two ways: as a quote, or as a finalized invoice. The customer has the option to download the invoice as a PDF for their own records by clicking the 'Download as PDF' button, and the ability to pay the amount due by clicking on the 'Pay Invoice' button. The customer must click 'Refresh' to view the updated invoice. 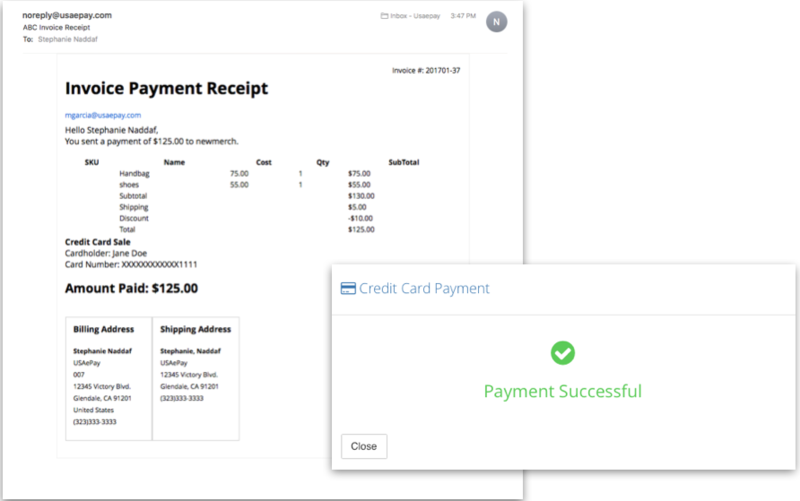 Once the invoice is sent, the customer can pay the invoice by clicking the 'Pay Invoice' button while viewing the invoice to pay online via credit card or bank account information. If the invoice was paid offline, you can simply mark the transaction as paid. Please Note: If you would like to allow merchants to pay using bank account information, you will need to enable this in Invoice Options. When the customer clicks the 'Pay Invoice' button, the following screen will appear. To pay with a credit card, fill out the fields shown. To pay by check, select 'Check' at the top of the module then fill out the fields below. If you create an invoice and the customer pays you, but doesn't pay through the invoice link sent via email, the system allows you to mark the invoice as paid. You can also leave a note about how the invoice was paid. The status of the invoice must be Quote, Sent, or Viewed to use the mark as paid offline feature. To mark an invoice as paid offline first open the invoice and click the button, at the top right of the page. Use the External Credit option when the customer pays you by credit card, but not through the link sent via email. The system gives you the option to enter the Card Holder Name and Comments about the transaction, but it is not required. Click to mark the invoice as paid. Click to cancel and leave invoice unpaid. Use the External Check option when the customer pays you by check. The system gives you the option to enter the Account Holder Name, a Check Number, and Comments about the transaction, but it is not required. Click to mark the invoice as paid. Click to cancel and leave invoice unpaid. Use the Cash option when the customer pays you with cash. The system gives you the option to enter Comments about the transaction, but it is not required. Click to mark the invoice as paid. Click to cancel and leave invoice unpaid. Once an invoice has been paid (through the emailed link or marked as paid offline) the invoice will show a 'Paid' stamp when you are looking at the invoice details. If you would like to see the transaction associated with the invoice payment click the payment method at the bottom of the page. 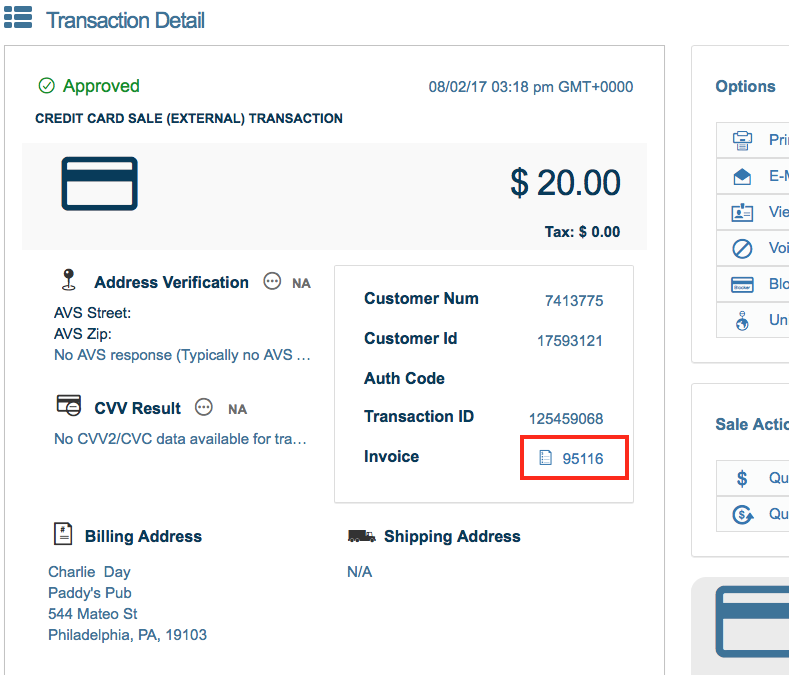 When you are looking at the details of a transaction associated with an invoice you will see an icon next to the invoice number. You can click on this invoice number to see the invoice. 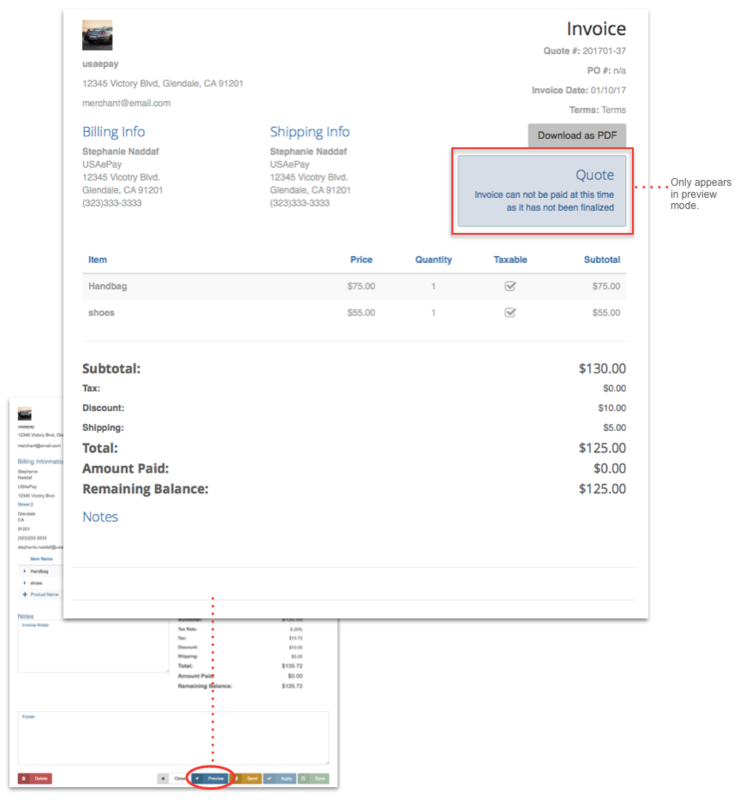 Within the transaction details, at the bottom of the page, there is a dropdown section labeled Line Items that when clicked, will show the details for each product in the transaction. SKU This the number assigned by the merchant in the Product Database. Cost This will be the cost per item assigned by the merchant in the Product Database. Quantity The amount of the same item listed in the line item. Subtotal The total amount of all items listed in the line item. Taxable This will show if the item is set to be taxable. 'Y' for yes and 'N' for no. Tax If the item is taxable the value of the tax will appear here. Discount If the item has a discount applied to it, the value will appear here. The complete total including tax and tip will appear at the bottom right of this section and should match with the total number at the top of the Transaction Details page. 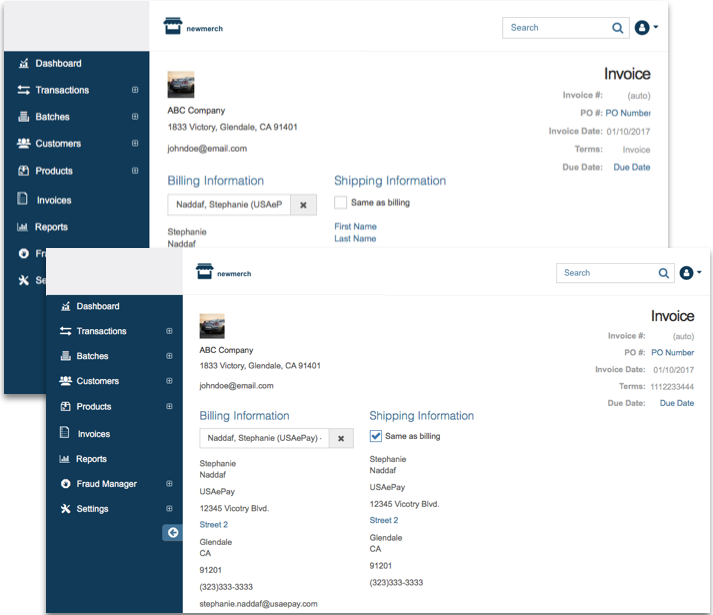 Use the Search bar on the Invoices main page to search all invoices for a specific category including, Date, Invoice Number, Shipping Address, Merchant Email, and more. To start your search, type the '@' symbol into the search bar at the top of the invoices main page. 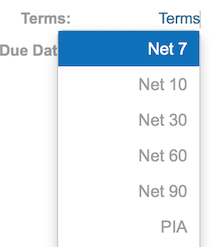 A drop down menu will appear with all the different options to search your invoices. Click on the field you want to use to narrow your search. After selecting the field you would like to use to narrow your search, type in the criteria you would like to use to filter the results. A drop down menu will appear with the results that match the search criteria. Click on the option that best matches your search. You should now see a list of invoices that match the search criteria you entered. A confirmation that the transaction was voided will appear. When you return to the Invoices home page the status the invoice you voided will now read 'Sent' instead of 'Paid'. IMPORTANT Please be careful when voiding and resending invoices to be sure your customers are not charged twice. As an example, lets say you sent out an invoice to your customer and they promptly pay it in full. Later that day (before your batch has closed), the customer contacts you because they paid the transaction on the wrong card by mistake. You found the transaction in the Batch Manager and voided it but you did NOT select ‘Release Funds Immediately’ and you resent the invoice to the customer. The customer paid the invoice on a new card. After you have received payment on the new card, you reversed the original void by mistake in the Batch Manager. In this case, the customer will have paid for the same invoice twice. When you look at the status in the Invoices home page for this invoice it will say 'Overpaid'. This is to warn you that this invoice was paid twice. A pop up screen will appear to confirm the refund. Click 'Refund' to confirm. A confirmation that the transaction was refunded will appear. When you return to the Invoices home page, the status the invoice you voided will now read 'Refunded' instead of 'Paid'. Click on button to apply all changes and continue editing the Invoice Options. 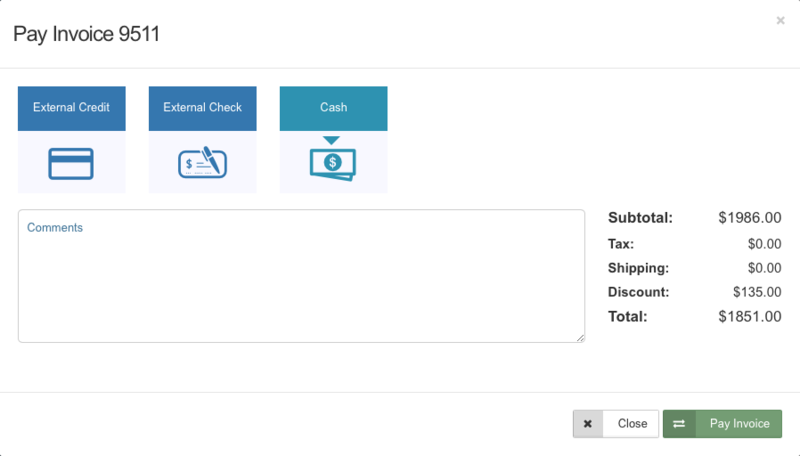 Click on button to save all changes and exit the Invoice Options page. 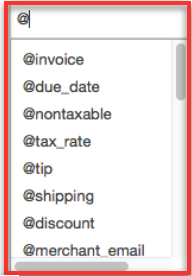 Click on button to close out of the Invoice Options page. In the Default Terms section, click the field and select one of the common term options from the dropdown menu or enter custom terms in manually. Each of the common term options is described below. Enabling this setting to tax the shipping, and disable to make shipping nontaxable. 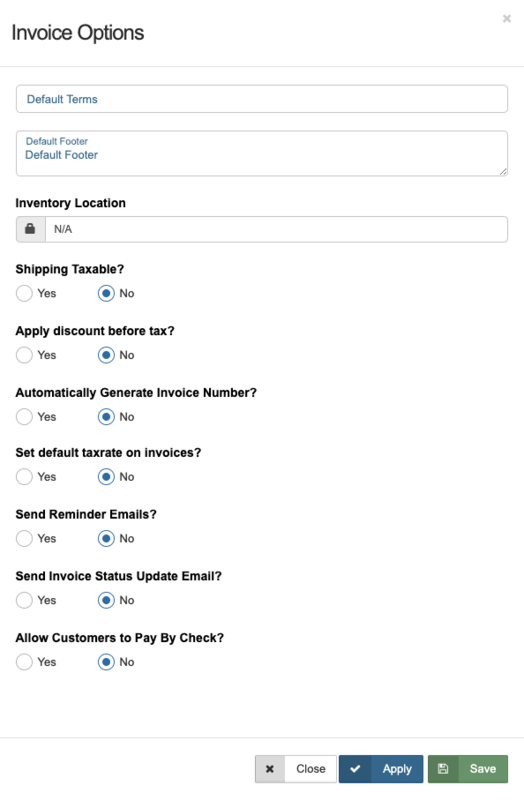 This setting will designate which warehouse inventory will be deducted when adding products to the invoice. If the selected warehouse does not have the product, then you will not be able to add the product to an invoice. 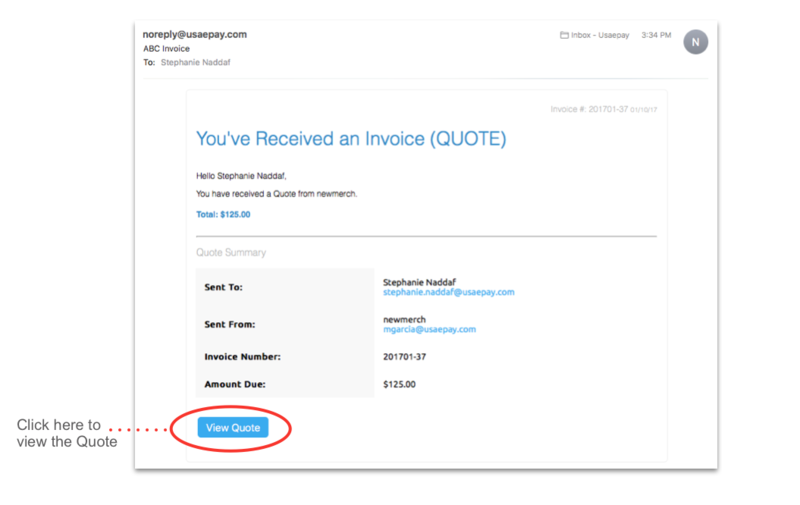 Enabling this feature will automatically generate an invoice number for each invoice you create. Invoice Prefix: Type in an invoice prefix of your choice in this field. To set the date as the prefix, type in [date] to use today’s date. Next Number: Type in the number you would like to be used as the starting point for the invoice number. Offset: Type in a number you would like your invoice to increment by. For example, if the next number is set at 105 and the number offset is set at 2, the number for the next invoice will be 107. Tax Rate %: Type in the tax rate here to automatically add tax to all invoices. Number of days between reminders on invoices with no due dates: Set the number of days you would like between reminders on invoices that do not have a specific due date. 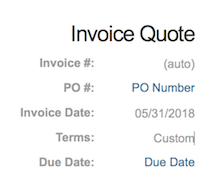 Number of days before an invoice due date: Set the number of days you would like a reminder email to be sent before an upcoming invoice due date. 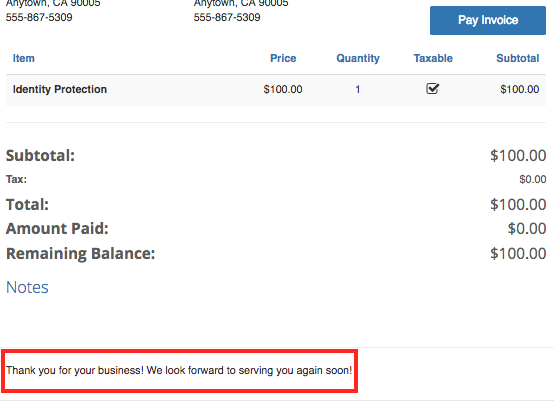 Enabling this setting sends the merchant emails when the status of invoices update. For example, if a customer pays an invoice, then the email entered will receive an email like the one below. 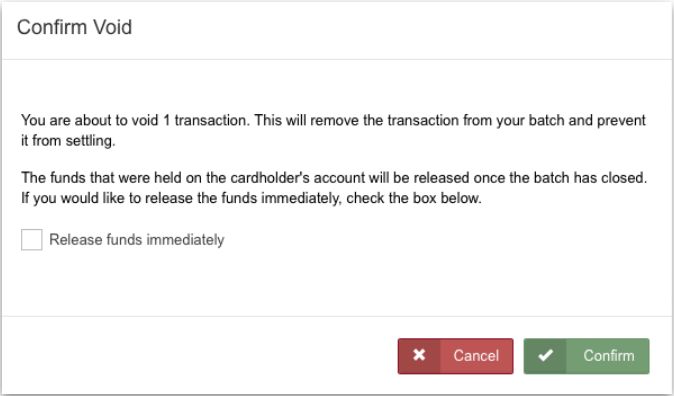 Enabling this setting to allow customers to pay with bank account information. Please Note: You must be set up for check processing to enable this option. The system allows you to print invoices or to export invoices as a PDF. You can do print or download the invoice at any stage or status of the invoice process. 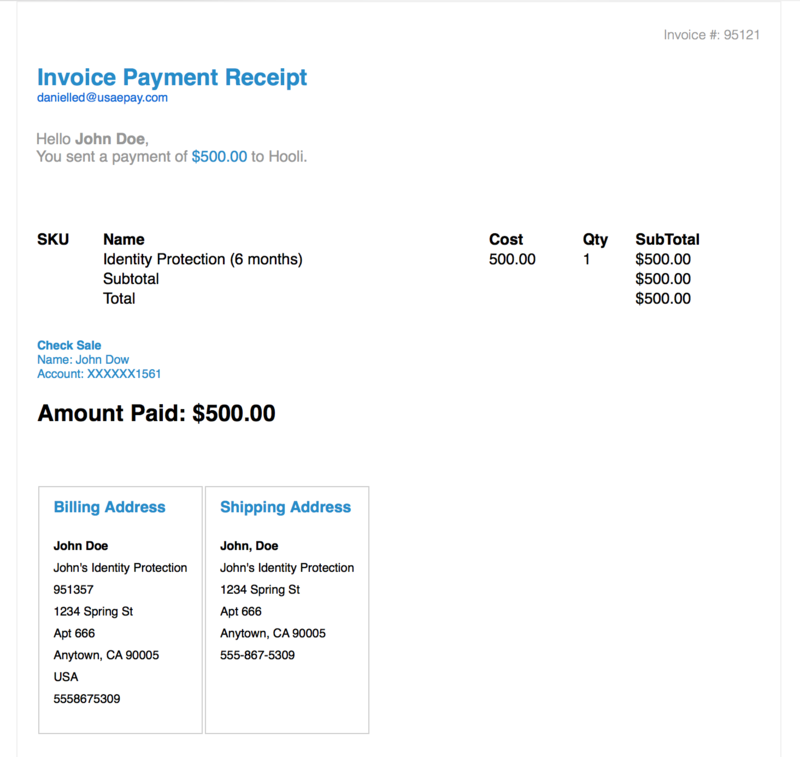 Simply open the invoice and click at the bottom of the page. You will see the print and download options on the top right hand side.